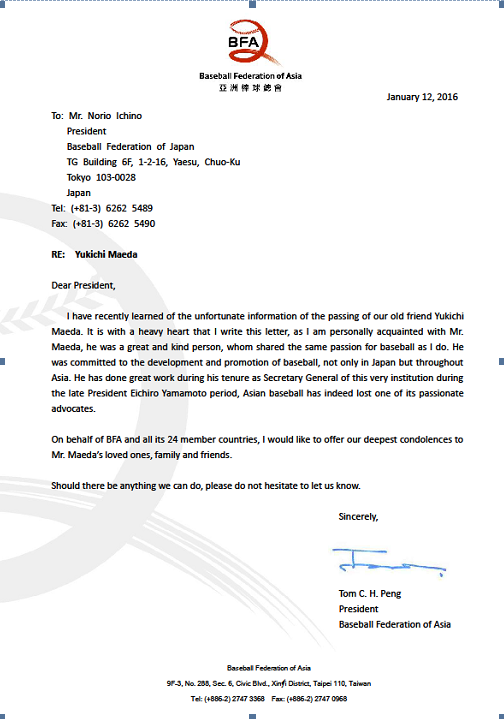 BFA President Tom Peng sent a letter of condolence to President Norio Ichino of Baseball Federation of Japan to express grief over the death of Mr. Yukichi Maeda, a close friend of Mr. Peng, and admiration of his work as former Secretary General of BFA. Mr. Y. Maeda died of pneumonia on January 7, 2016 and funeral service will be held in Tokyo on January 16. See our newsletter “Beloved Manager and Friend of International Baseball, Mr. Yukichi Maeda Passed Away” on January 10.